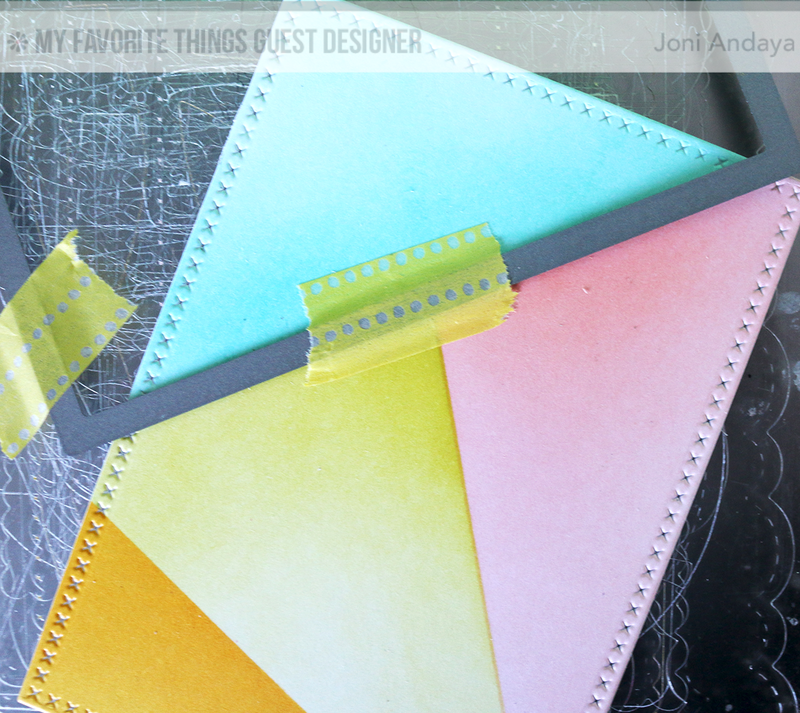 Hello Everyone, I am so excited to be guest designing at My Favorite Things blog today. 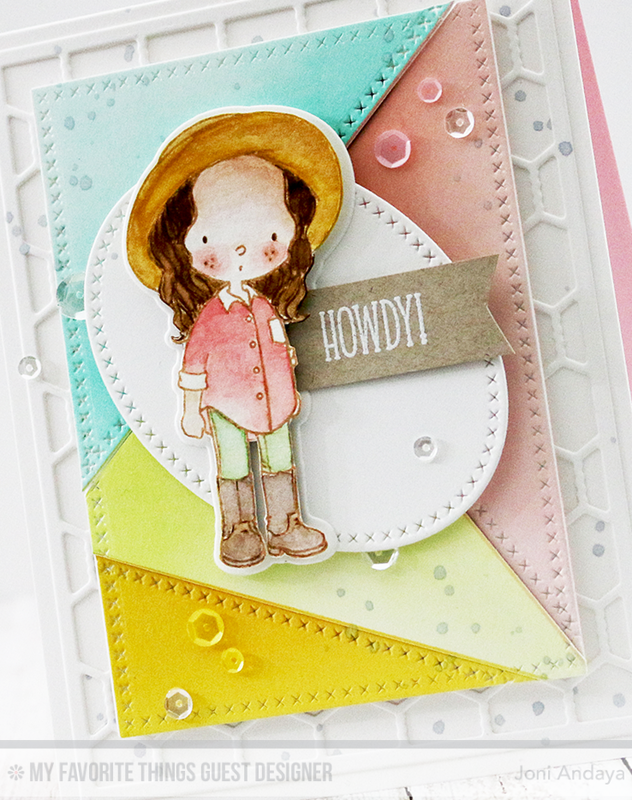 I am showcasing their new release Green Pastures and Perfect Harmony stamp and Coordinating die-cuts. To begin I die-cut the Die-namics Mini Chicken Wire on a white cardstock and adhered using a Mono Tombow Multi glue it on a white A2 card base. Next, I distressed the white cardstock panels in sections using post-it. Next I die-cut the distressed panel with the new Die-namics Cross-Stitch Rectangle STAX using the largest rectangle first. Then die-cut each section like the one you see below using the Die-namics Cross-Stitch Rectangle STAX . I also used the Die-namics Cross-Stitch Oval STAX where the Green Pasture girl stands to give contrast on the colored die-cut panel. The Green Pasture girl was watercolored and fussy cut and adhered on the Coordinated die-cut piece with foam tape for dimension. Here's the close up of all the pieces. The sentiment "Howdy" is also from the the Green Pastures stamp set, which where white heat embossed on a kraft cardstock. 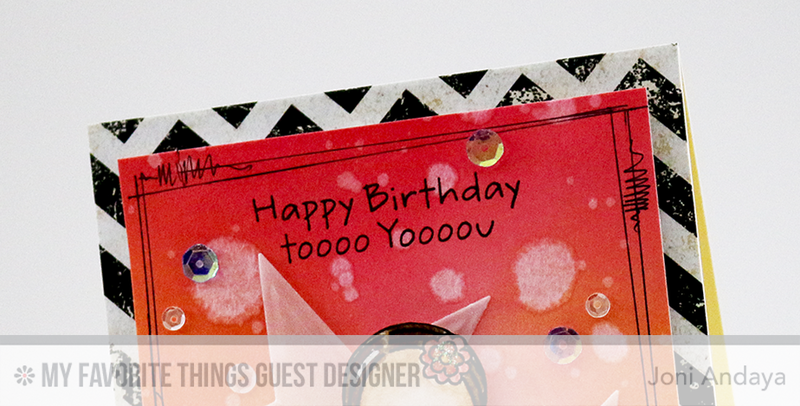 I added some sequins from Pretty Pink Posh Sparkling Clear, Lemon Drop, and Pink Blush to finish off the card. For the next card, I cut a chevron patterned paper and adhered it on the white card base. Next, I cut another panel of white cardstock and distressed it with Distress ink pad. After distressing I added some drop of water using my paint brush. Once the panel is dry, I added some lines using a black pen for interest on the panel to tie the colors with the chevron card base. Then I added the "Happy Birthday toooo yoooou" sentiment also from the same set from Perfect Harmony stamp set. Next, I die-cut some vellum using the Die-namics Star STAX, to add softness to the background. The Perfect Harmony girl is also watercolored and fussy cut. I also added some Stickles on her flower clip and dress for a little sparkle. Finally I added some Pretty Pink Posh sequins in Bermuda Blue, Lavender Moon, Sparkling Clear, and Marshmallow to finish off the card. Joni, your work is absolutely AMAZING. You bet I enjoyed! These are fabulous, Joni! You are so very, very creative, my friend! It's just genius what you did with those rectangle STAX dies! And I love those vellum stars and the brilliant way you doodled to pull everything together. And gorgeous watercoloring, too! Love every little detail! Joni!!! How adorable - love that little cross-stitched detail! I'm playing with my Lola set today! Such a fun card. I love all the dimension and your coloring. Congrats on the guest DT spot. Wow wow wow!! These are both AMAZING!!!!!!!!!!!!!!!!!!! 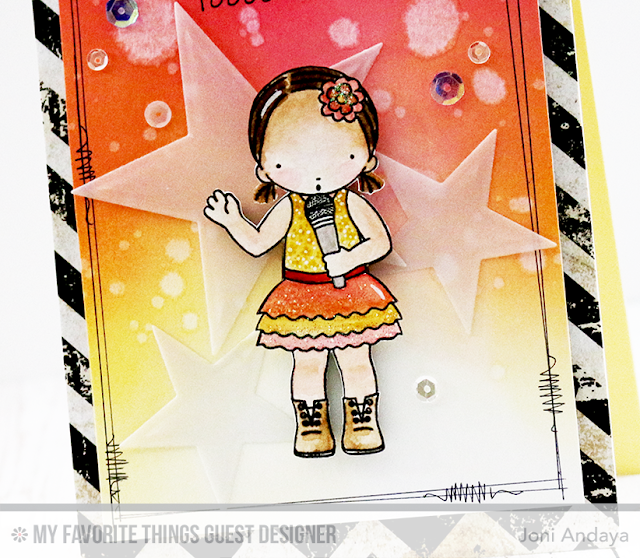 Love how you used the Die-namics to create the patchwork design--awesome! Joni both of your cards are AMAZING! You are one creative girl!! The background on the first one is so clever and your coloring so pretty! Love them!! alway so creative.. i love how you always find other ways of using the dies.. congrats on your DT spot.. Wonderful! Love the colors of your stitched patches on the first card and just really love your second birthday card!! The black and white stripe with the stars and bright colors are perfect! Super, fantastic and any other adjective you want to throw in there! Love your work!!! Congratulations on guesting Joni, well deserved!! Both of your cards are fabulous. perfectly layered, beautifully designed! I really love the cards you made!